Publishing a little late but hey, it’s school holidays, less traffic on the streets and, apart from that, your Digest author has been otherwise engaged. We have all sorts for you in this issue, so do please read on. Glasgow Broomielaw District Regeneration Framework, closes TOMORROW, 05 April. 1.1 Glasgow Broomielaw District Regeneration Framework, closes TOMORROW, 05 April. We have mentioned this a couple of times already and the GoBike letter of response, penned by the redoubtable Brenda will be going in tomorrow, bang on the deadline. Please do complete the on-line survey, and our advice is to “Strongly Agree” with the proposals but “Strongly Disagree” that the content of the document can make them real. Use the boxes to get your views in. The Consultation information is here and the survey is here Enjoy! This plan featured as item 1.5 in Digest 30 and a brief GoBike response will be submitted tomorrow, again right on the deadline. Do put your fingers to the keyboard and let NLC know your views if you live, work or cycle in North Lanarkshire. Just in this week on twitter, news from the Yorkhill and Kelvingrove Cycling Village. Do get along and support them if you can. If this community can do it, why can’t yours? Time to get active in your community, persuade your councillors to do more for cycling and let’s make Glasgow and surrounds cycling-friendly. I refer to the forthcoming events and apologise for providing you with such short notice. Community Links Plus is a design competition which is run by Sustrans Scotland and supported by the Scottish Government which allows local authorities and other statutory bodies to bid for funding to design and deliver exemplary and inspirational cycling, walking and place-making projects. As you may be aware, in previous years Glasgow City Council was successful in winning funding for its South City Way project and the Connecting Woodside project. 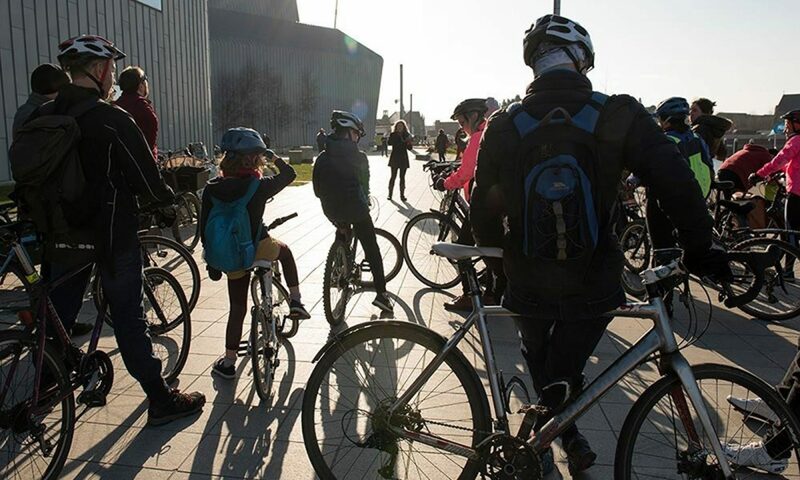 As part of the current competition, Glasgow has three submissions that have progressed into the second round of judging: Glasgow Avenues Plus, North City Way and Yorkhill & Kelvingrove Cycling Village. If you require any further information, or cannot make the event and wish to make contact, please email sustainabletransport@glasgow.gov.uk or phone 0141 287 9171. All the details for this proposal were in Digest 30 and the GoBike letter of support is here This is a residential area and it should not be used as a car park; please do support the restrictions on what even the City Council call “obstructive” parking. Do visit the website, https://battlefieldproposals.commonplace.is/ and put your comments in. We would like to invite you to view the latest designs produced for the North Toryglen green space & active travel project on Monday 15th April. We are holding two sessions in Toryglen Community Base between 12pm-2pm and 3.30pm-6.30pm. Please see the poster attached and let me know if you plan to come along. If you are unable to attend you will be able to view and comment on the designs online at www.urbanroots.org.uk/northtoryglen from April 15th-30th.The interactive feedback map is also still live here if you wish to add any comments. Do get yourself there if you can. Do write in to let East Dunbartonshire Council know your views. The Council propose to consider the introduction of the above named Traffic Regulation Order. Please find enclosed a copy of the press notice of the proposed Order, relevant map, statement of reasons and detailed report. Details of the proposals will also be available on the Glasgow City Council website at www.glasgow.gov.uk/proposedtro. These changes are required, as far as we can see, to facilitate the long awaited construction of the South City Way and will be supported by GoBike. We have nothing for you this time. We featured this in our Consultation Extra last Friday and Calum and Tricia from the GoBike committee went along (hope some other GoBike members did too). The news is good, although things are at an early, information-gathering stage. Disability campaigners agree with us about the need for dropped kerbs (none outside the library) and the desire to get rid of pavement parking. The City Council have revised their initial plans, responding to views from local residents. It was initially thought that radial routes to the city centre would be a priority, but east-west travel to Springburn, Bishopriggs and Milngavie is important, so it’s likely that a network of routes will be developed. That’s it for this delayed edition but we’ll be back again a week on Tuesday.